By Ronald J. Litwin, Robert E. Weems, and Thomas R. Holtz, Jr.
Few subjects in the Earth sciences are as fascinating to the public as dinosaurs. The study of dinosaurs stretches our imaginations, gives us new perspectives on time and space, and invites us to discover worlds very different from our modern Earth. From a scientific viewpoint, however, the study of dinosaurs is important both for understanding the causes of past major extinctions of land animals and for understanding the changes in biological diversity caused by previous geological and climatic changes of the Earth. These changes are still occurring today. A wealth of new information about dinosaurs has been learned over the past 30 years, and science's old ideas of dinosaurs as slow, clumsy beasts have been totally turned around. 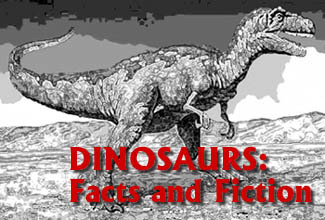 This pamphlet contains answers to some frequently asked questions about dinosaurs, with current ideas and evidence to correct some long-lived popular misconceptions. Although much has been discovered recently about dinosaurs, there is still a great deal more to learn about our planet and its ancient inhabitants. When did the first dinosaurs appear on Earth? Are all fossil animals dinosaurs? What was the biggest dinosaur? What was the smallest? How long could a dinosaur live? How fast could dinosaurs walk or run? Which was the smartest dinosaur? Where can I find more information about dinosaurs? This publication is out of print and no longer available as a paper copy. Maintained by Publications Web Team.